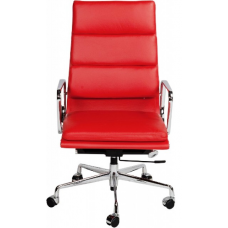 Eames Style Office Chair High Back Ribbed Red Leather provides extreme comfort at work. It supports your back so fittingly that one cannot complain of any back ache due to heavy wokload. The eames chair replica are capable to adapt to fit the body snugly and deliver seating comfort.